The E-book includes bookmarks and page thumbnails so you can move easily between chapters and pages. You can search the entire book for specific terms or topics in seconds. 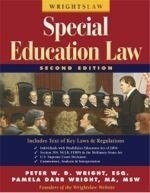 NOTE: If you purchase more than one copy of Wrightslaw: Special Education Law, 2nd Edition Print & E-Book Combo, be sure to provide all email addresses in the comment section.